Bozeman is a city in and the county seat of Gallatin County, Montana, United States, in the southwestern part of the state. Satisfy your inner culture vulture at American Computer Museum and Beaver Ponds Loop Trail. Popular historic sites such as Fort Yellowstone Historic District and The Soldiers Chapel are in your itinerary. 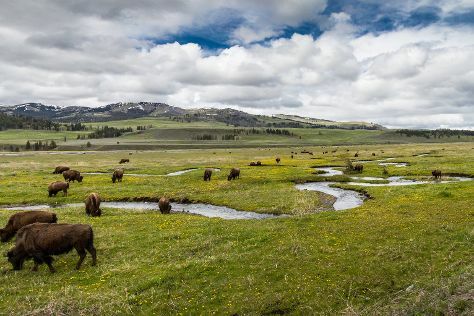 You'll find plenty of places to visit near Bozeman: Yellowstone National Park (Lamar Valley, Mammoth Hot Springs, & more) and Big Sky (Grizzly Outfitters Ski & Backcountry Sports & Horseback Riding Tours). On the 17th (Mon), dedicate a day to the elevated beauty of Bridger Bowl. There's much more to do: take in breathtaking views at Gallatin Canyon, cast your line with a fishing tour, and stroll through Middle Cottonwood Trailhead. For more things to do, traveler tips, and tourist information, go to the Bozeman itinerary planning app . In June in Bozeman, expect temperatures between 77°F during the day and 45°F at night. Wrap up your sightseeing on the 18th (Tue) early enough to travel back home.